One of the things that makes Puerto Armuelles unique is its neighborhoods. Puerto Armuelles has distinct neighborhoods, most with a unique feel and look. In part, this is because of the town’s history. Starting in the late 1920s, Chiquita Banana built Puerto Armuelles from scratch. Chiquita designed and built its neighborhoods to house different classes of workers. Unfortunately, it was a time, especially when combined with Chiquita’s colonial & company town attitude, when segregating people by race and class was much more acceptable. The map above shows Puerto’s core neighborhoods plus those that tend to interest expats. I describe all of the neighborhoods that appear on the map, plus 3 more, below. However, there are 2 dozen or more neighborhoods in Puerto Armuelles. I encourage you to go out and explore Puerto’s neighborhoods yourself. The neighborhoods that don’t appear on our map have no special attraction to ex-pats. That said, you can find an ex-pat or 2 living in most of them. It could be the place for you. You only need to explore them to find out. To name a few neighborhoods that don’t appear on our map: Los Angeles, Aqua Bueno, Flor de lima, Fabrica de Cajas, Santa Fe, Monte Verde, Llano bonito, San Francisco, Returno, Las Lomas, Las Acacias, and Alto San Vicente. A boots on the ground look is especially useful, if you are looking for a rental. Most rentals are not listed anywhere online. Your best bet is to ask around and to drive around looking for “se alquilar” (for rent) signs. You can tell for whom Chiquita built a neighborhood, by looking at the housing density. The higher the density, the lower the residents were on the corporate pecking order. 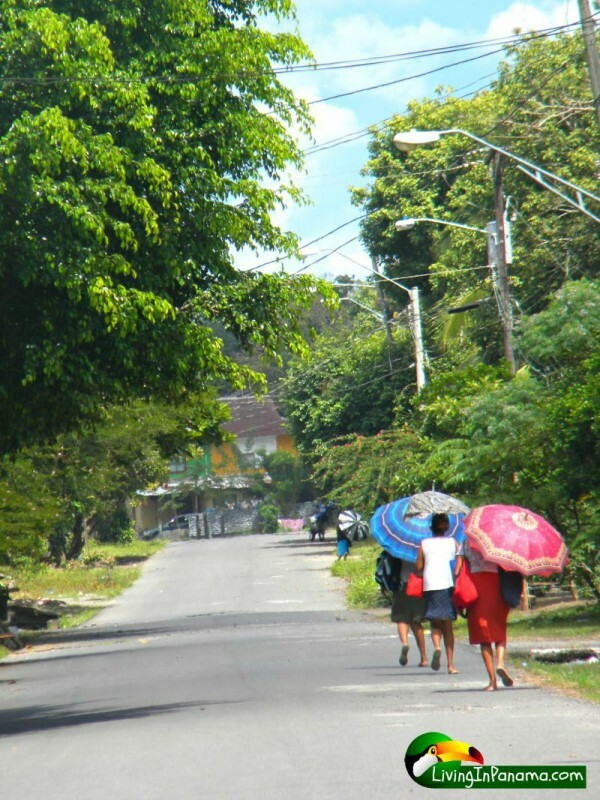 Other, non-Chiquita, neighborhoods were created more organically and are made up of the concrete houses with tin roofs that are common throughout Panama. 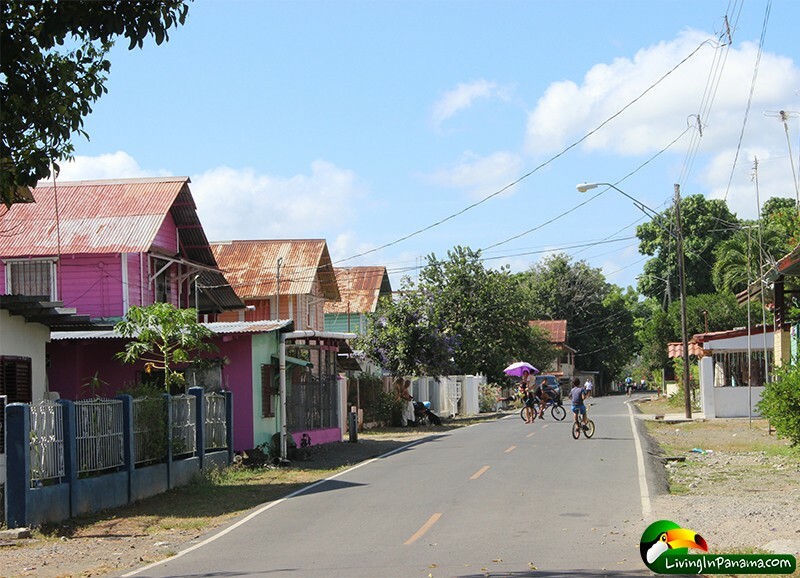 Many of the non-Chiquita-built neighborhoods in Puerto Armuelles also have their own distinctive feel and look. Chiquita built wooden houses up on stilts. 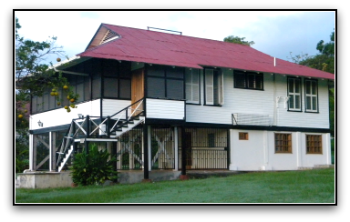 The houses were designed for the tropics with big overhangs and plenty of ventilation. Over time, some people have enclosed the ground level and made other changes. But the Chiquita houses are still instantly recognizable. Originally Chiquita built all its houses out of North American red cedar. They shipped it down from Oregon. Chiquita used red cedar because it is resistant to both rot and insect infestation. I describe the in-town neighborhood first, then the out-of-town neighborhood. What I term “out-of-town”, are still part of Puerto Armuelles, but not Puerto Armuelles proper. San Vicente – San Vicente is our pick for the best in-city neighborhood. It is a beach community with large lots and a sleepy feel. 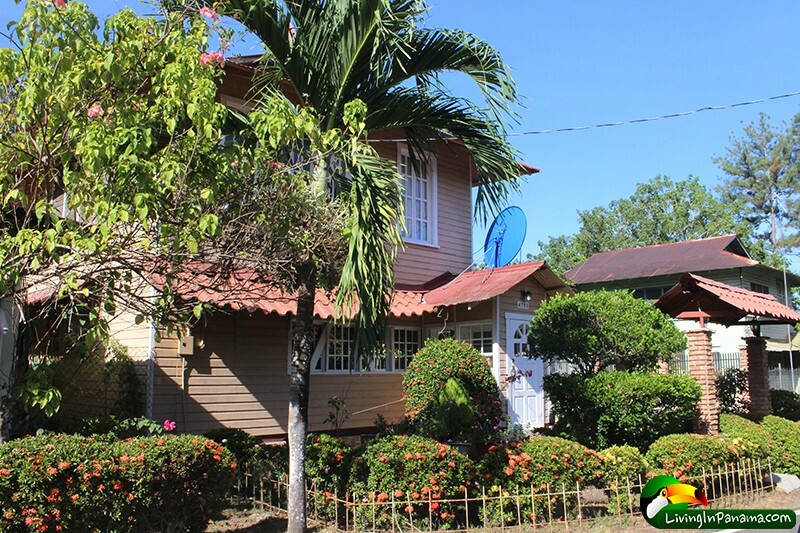 San Vicente a non-Chiquita neighborhood and consists of the typical concrete stucco houses with tin roofs. 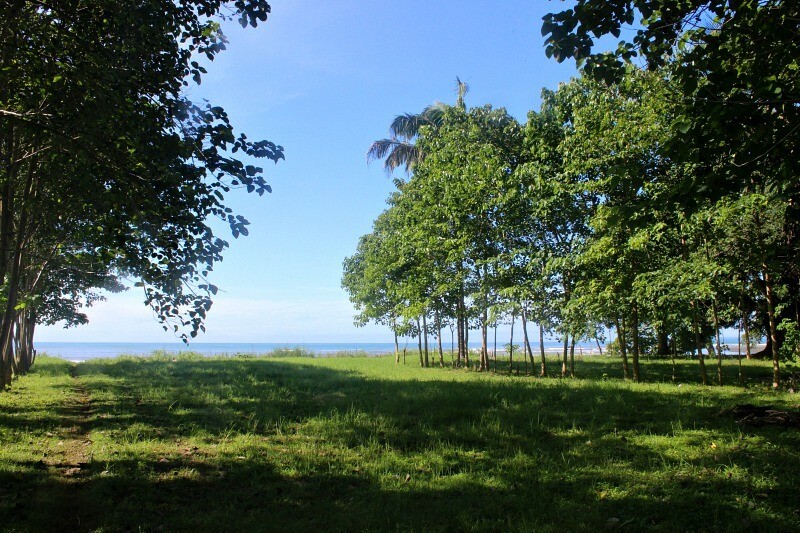 Many of the oceanfront lots are big and some of the lots a block or two off the beach are as large as half an acre. 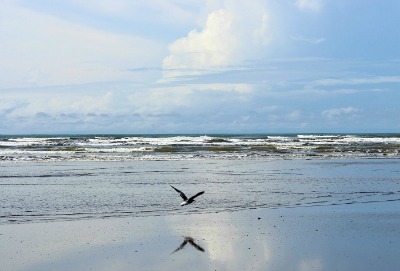 The neighborhood is valued for its proximity to downtown, its quiet spacious feel, and its long & wonderful beachfront. 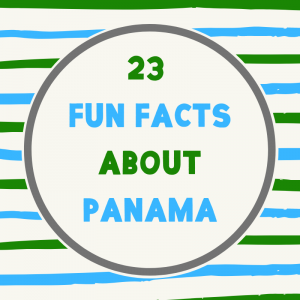 It is home to 2 of Puerto’s best hotels, Big Daddy and Tsunami Inn. It also has a few small grocery stores, restaurants as well as one of Puerto’s larger baseball stadiums (recently rebuilt). This attractive home is in the San Vicente neighborhood. Carmen – is on the waterfront and just south of downtown. The neighborhood is a 20 block strip of land between the ocean and the airport. Carmen has a few small grocery stores, electronic repair shops, restaurants, a few retail shops, and 1 small park. Chiquita built this high-density neighborhood for its dock workers. 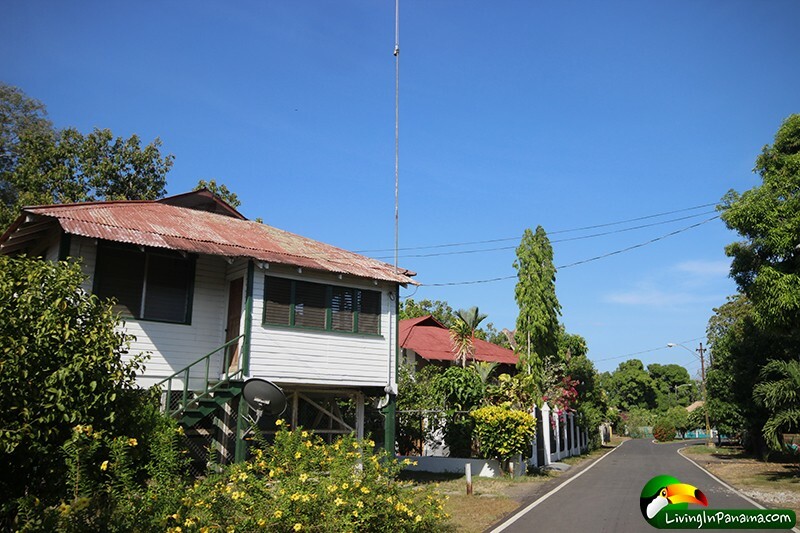 Like all of the Chiquita built homes, the houses in Carmen are simple wooden-sided structures on stilts. The houses were all built as duplexes, densely packed together with tiny yards. The bathrooms were for common use and were located on the street. That has all changed now. People, not the company, now own the houses. Though many are still duplexes, they all have their own bathrooms. It’s nickname used to be Silver City because the workers made so much money (due to overtime pay) it was as if the streets were made of silver. About half a dozen ex-pats have remodeled Carmen houses to their taste. 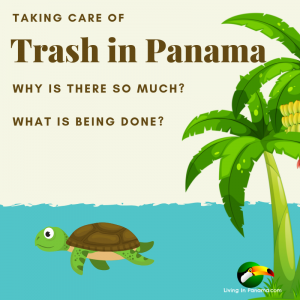 The majority of expats consider Carmen too dense and noisy to live comfortably. One can still buy a basic house in Carmen for around $15k dollars. Downtown – is a compact 4-by-4 block grid with a wide variety of shops and services. One of its best attributes is its 4 parks. The waterfront park is a nice place to hang out. (I give some history of this pleasant waterfront park here.) 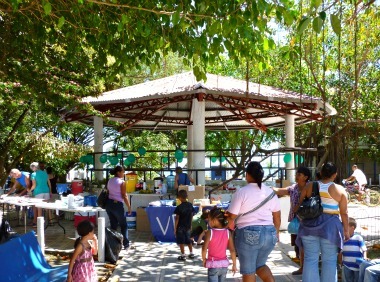 Across the street from the waterfront park is a park with a central gazebo where community events occur. The gazebo park is right next to the playground. The 4th park is kitty corner from the fish market a park with a number of benches and trees that people often hang out and visit. Of course, the downtown is also home to alot of shops and services: 4 banks, numerous small grocery stores and 4 larger ones, pharmacies, many restaurants and bars, Police station, city hall, post office, 2 bus stations, a big gymnasium, gas station, exercise gym, numerous fruit and vegetable stands, a fish/produce market (and a new one being built right next to it), and many retail other shops. 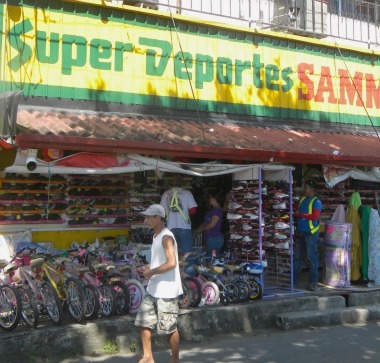 (Note: The large and modern grocery store, Romero, is just a 100 meters from downtown, on the main road). Pueblo Nuevo – located at northern edge of downtown. Pueblo Nuevo is a tiny barrio of about 3 blocks made up of very narrow, curving streets with densely packed wooden Chiquita houses up on stilts. 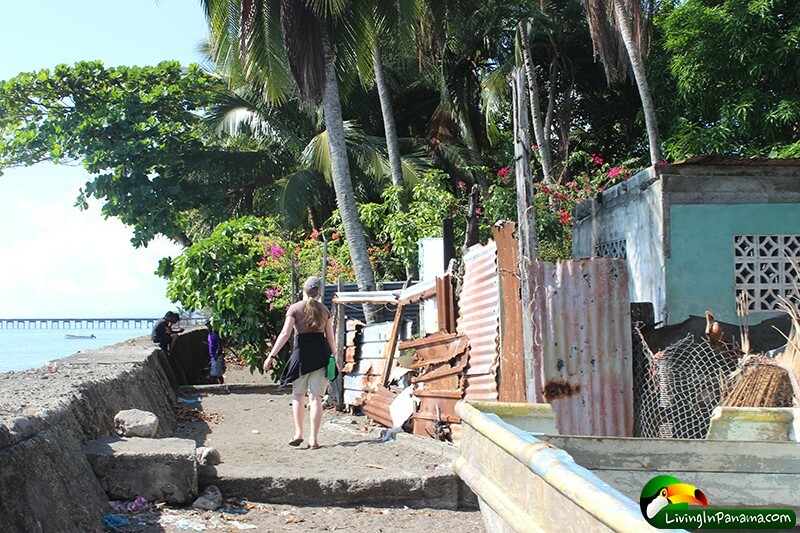 This was another of Chiquita’s worker neighborhoods. The beach front in Pueblo Nuevo is really a beach walk along the top of the break wall. It is a delightful walk, but the housing and fencing, with some exceptions, is pretty dilapidated. 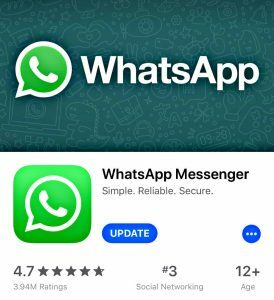 In the future it may be a valuable commercial area – but you’ll have a long wait, unless a big investor decides to develop it all at once. 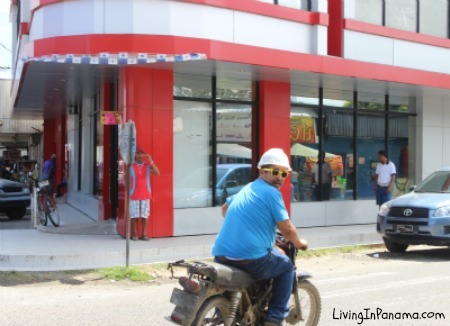 Pueblo Nuevo has an elementary school, a tiny store selling custom cut window glass and mirrors, a laundromat, a tailor, a water vending machine, and some very small grocery stores. There is also a Sunday music class, open to all children, in this neighborhood. A pleasant walkway along the breaker wall. It widens nearer to downtown. 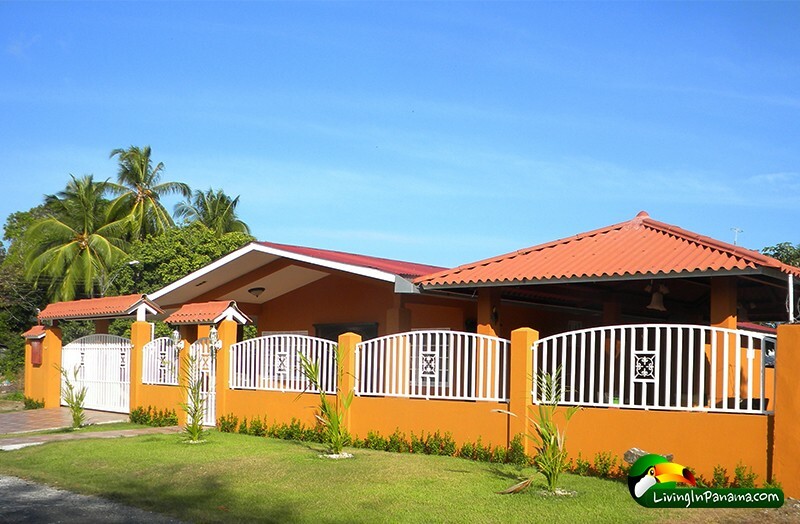 Rio Mar – For the most part, Rio Mar has a solid middle-class feel with nice houses. 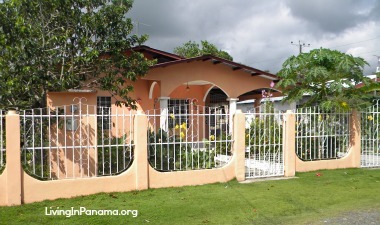 Rio Mar has a few blocks of Chiquita houses, eventually giving way to typical Panamanian style houses. Rio Mar is just north of Pueblo Nuevo & across a one-lane bridge spanning a small creek. 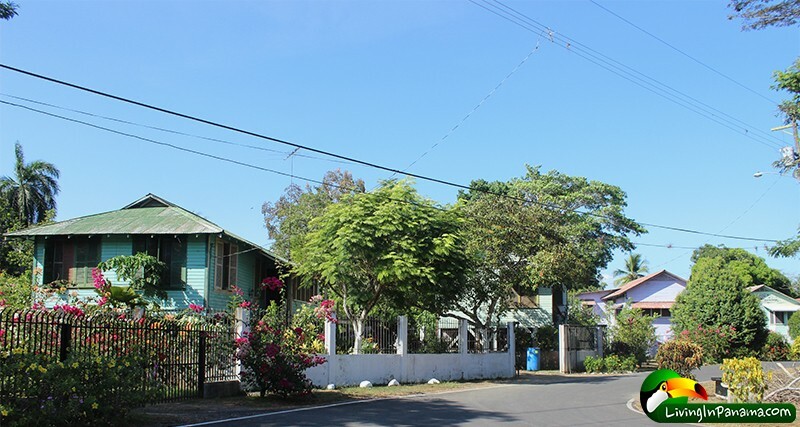 Rio Mar is one of Puerto’s biggest neighborhoods. Rio Mar does have a beachfront, but mostly it is non-beach. 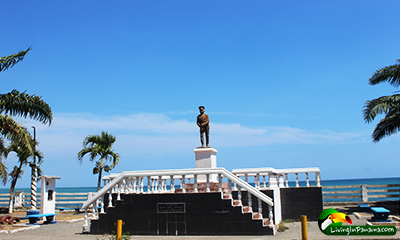 Rio Mar’s beachfront, like the beach in Pueblo Nuevo, is not among the better beaches in Puerto. 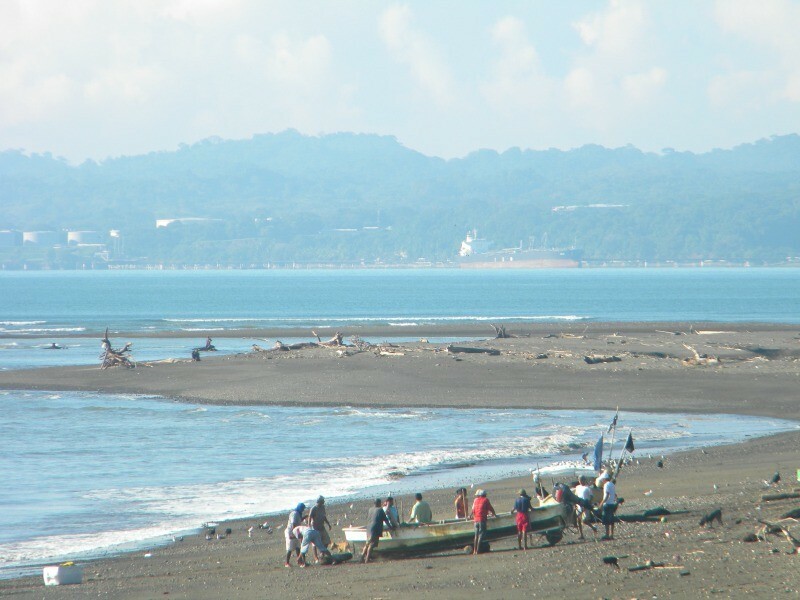 The beach here is behind a high bulk head and tends to be dirty. It is a safe quiet neighborhood near town, but it has no special attraction to expats. The big lighted baseball stadium is in Rio Mar. It is used for the rare national semi-pro games, which are fun to watch. Tickets cost $1. 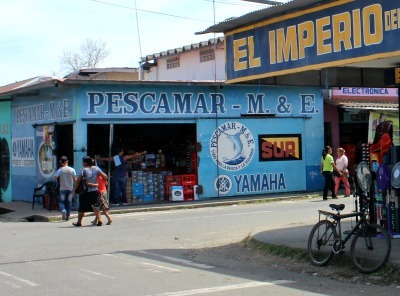 Rio Mar is home to a few schools, churches, a bike repair shop, small grocery stores, bakeries, restaurants (eg., El Pulpo, Pizza Pilo, Enrique’s, etc.) and more. 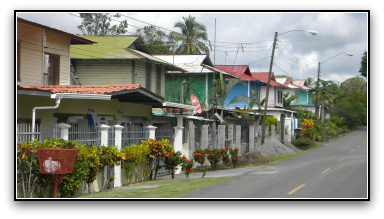 San Jose – As you drive down the main road into Puerto, you will see San Jose’s narrow, 2-story row houses. 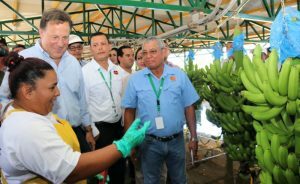 San Jose was built by Chiquita for mid-level managers. Originally, the houses were on stilts. Over time, most owners have enclosed the ground floor. We happily rented there for awhile. San Jose is right by the old railroad tracks, which is now a walking path. Romero supermarket is only 50 yards away. 2 or 3 expats are living in this neighborhood. Retail & Sevices area – West of Downtown Core – Between Supermercado Puerto Armuelles (which is at the intersection with the dolphin statue in the middle of the road) and the airport, is another retail area of interest. In this area, you will find the big Catholic Church & school San Antonio. 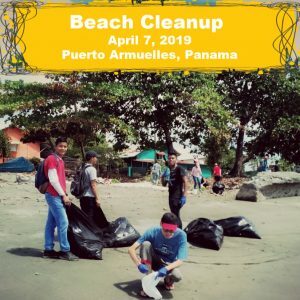 You will also discover a good bakery, labs, doctor offices, government offices, Andrea’s (the best internet, copy & office supply place in Puerto), baseball field, and fire station. Also the entrance to the Bella Vista neighborhood. 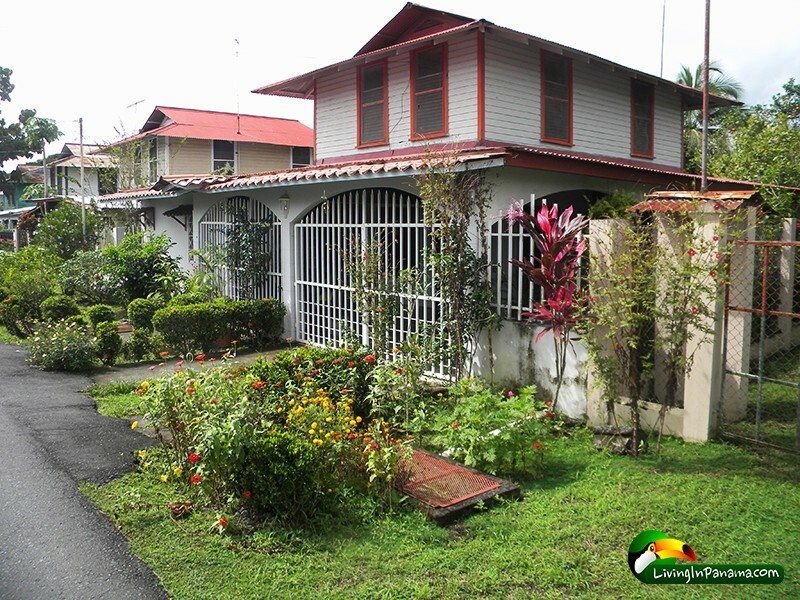 Bella Vista -Bella Vista, formerly called Spanish Town, was built by Chiquita for its higher level Panamanian managers. 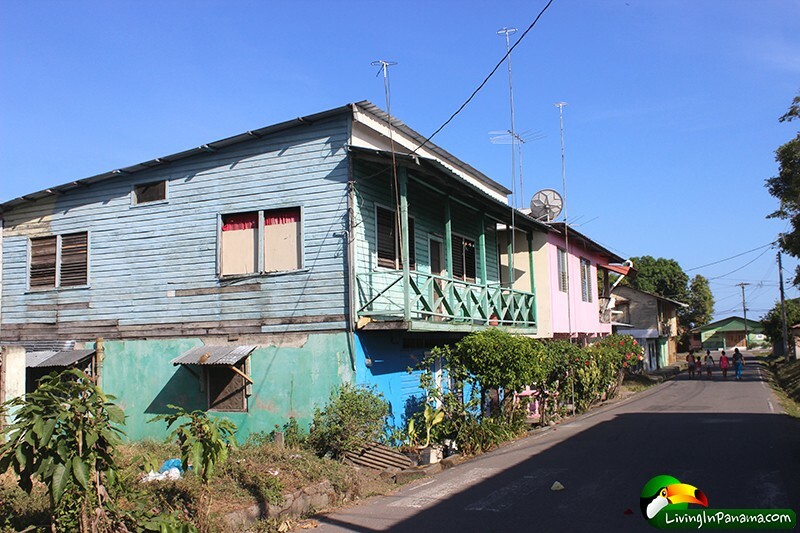 It is a pleasant neighborhood of curvilinear street, nice sized lots and wooden houses on stilts. Bella Vista is next to Las Palmas neighborhood. However, while you can walk directly between the 2 neighborhoods, you can not drive directly from one to the other. The neighborhood is much like Las Palmas, except that the lots are much smaller. This is a 5 way intersection, all of small streets. 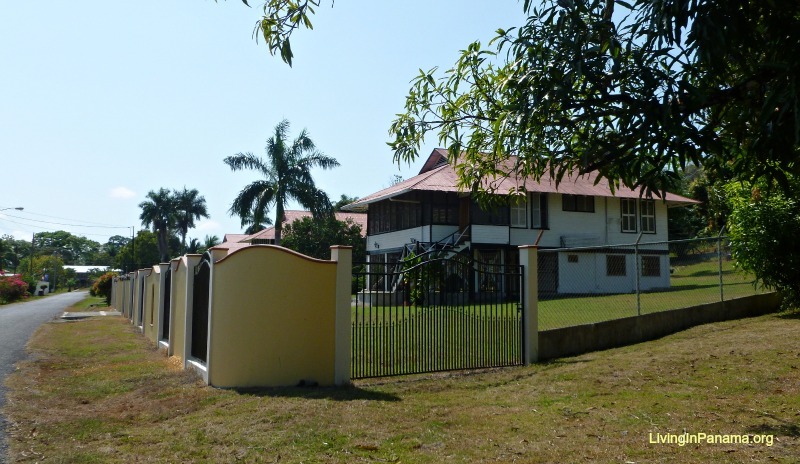 Chiquita built Las Palmas neighborhood for its North American executives. The wooden houses on stilts are larger and on large lots. It is a quiet neighborhood that does not connect to other neighborhoods, so car traffic is also low. 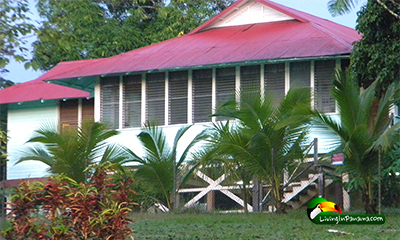 In the early morning hours you can hear the howler monkeys that live in the nearby woods. When the surf is up you can also hear the ocean. Also, at about 6:30 am all the crimson-fronted parakeets (they are the size of parrots) leave the neighborhood in a swoosh of green and squawking flight, and then at around 6:30 pm they all grandly return. They are here in between but they do make a mass show of their morning exit and evening return. 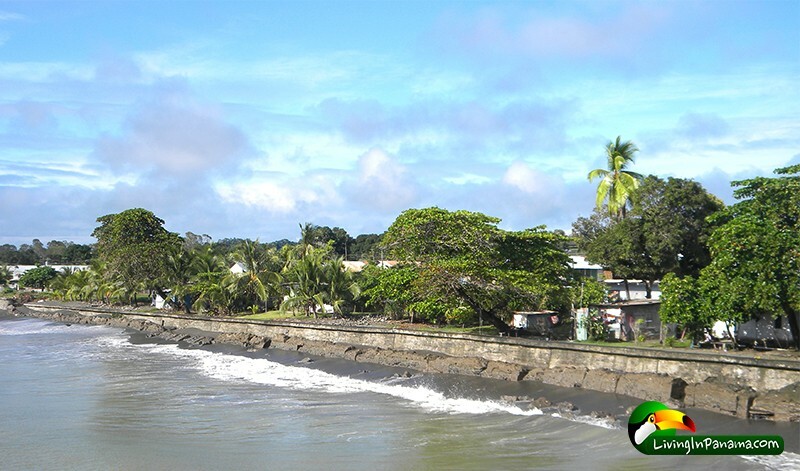 El Porvenir – begins just north of Rio Mar’s beachfront and continues along the beach until the San Bartolo river mouth. The area is dotted with mangrove swamps and bog land. Land speculators bought up the beachfront here back when there were rumors that El Provenir was going to be the site of a proposed multi-use pier. As of yet, there is no sign that the rumor is true. 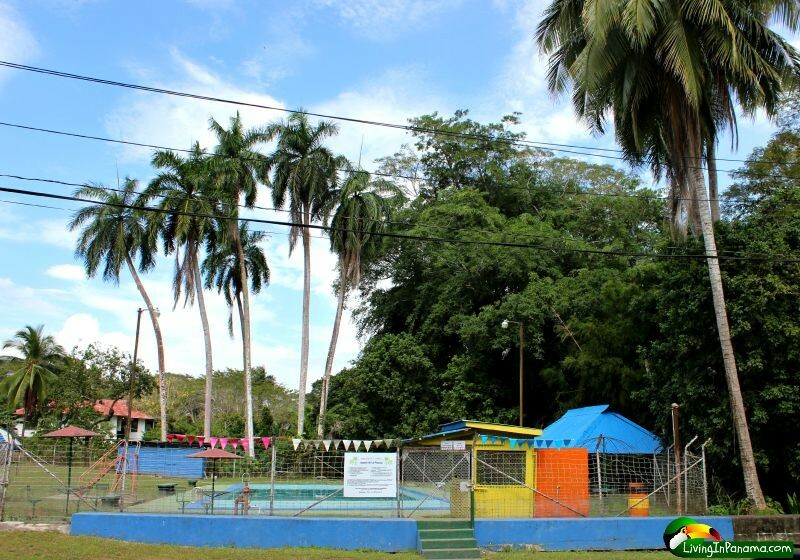 Northern Beach Neighborhoods – To visit the beach neighborhoods north of town, described below, you need to take the Corazon de Jesus turn off from the main road. The turn off is between Hotel Koko’s Place and a pedestrian overpass. Look for the highway sign to Corazon de Jesus. 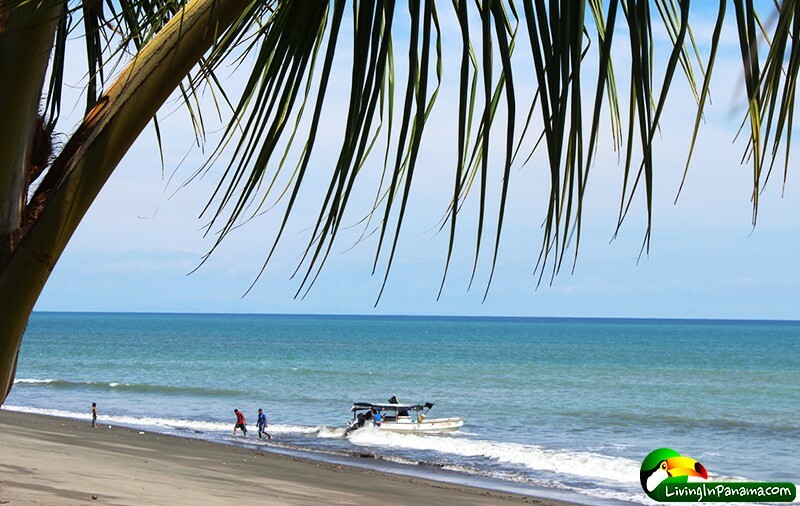 Pez de Oro – is a quiet place with a natural harbor and the widest beaches around. It is the first neighborhood north of the San Barolo River (see map above). 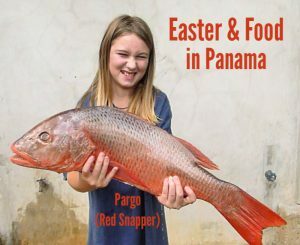 Pez de Oro is a small neighborhood in transition with many families having already left the fisherman’s life for an easier livelihood in David or Panama City. 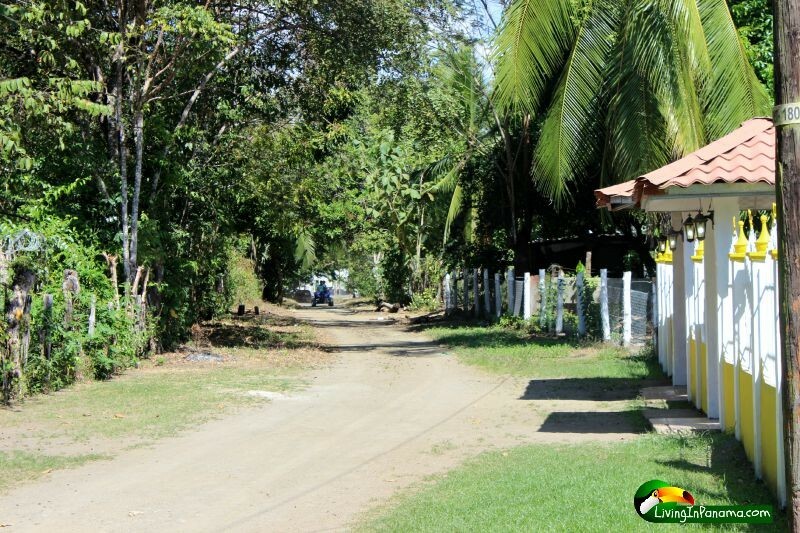 Corazon de Oro – Beautiful and serene beach area. 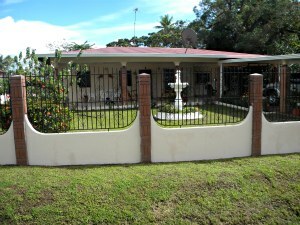 This area has taken on the name we gave to our properties here: Corazon de Oro (Heart of Gold). Of all these beach neighborhoods, it is the closest to places to eat & to shop for groceries. 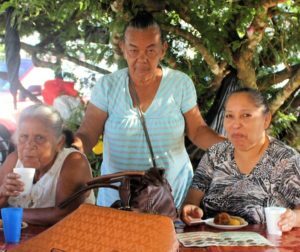 There are 2 good restaurants (El Rancho & Hermanas Bustos) and a cafe within 500 yards of the entrance to our Corazon de Oro properties, as well as grocery kiosk. This location is an excellent place to enjoy paddle boarding and kayaking. 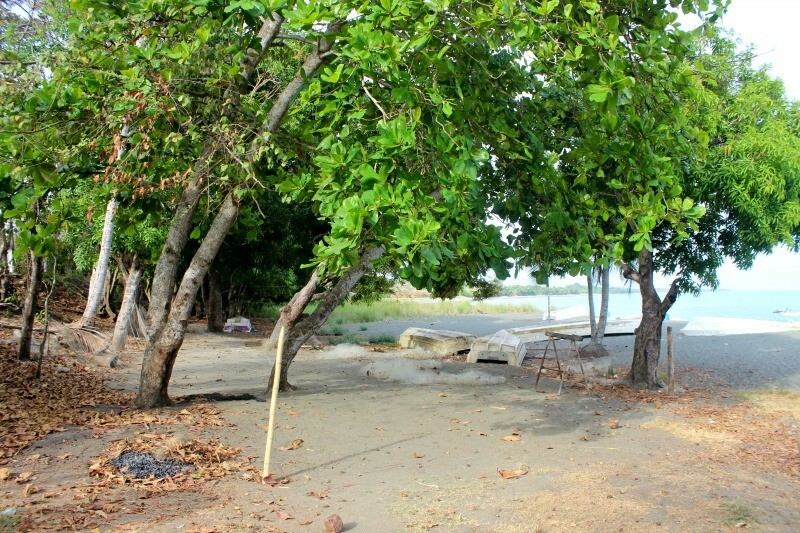 Corazon de Oro also has the potential as an excellent boat launching location. 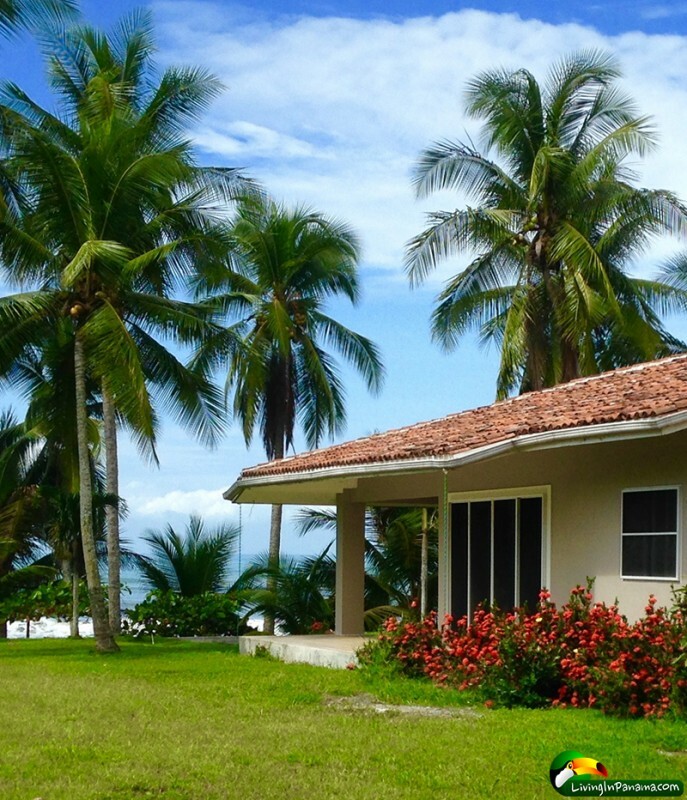 We have a number of gorgeous beachfront and near beach properties for sale here. 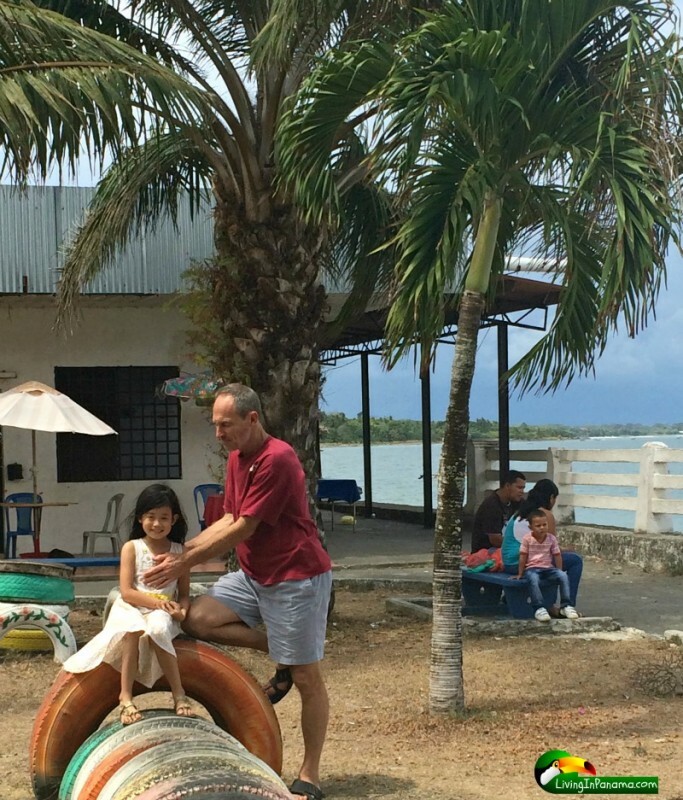 Corazon de Jesus – was the first beach neighborhood to attract expats. It is 10 minutes by car and 15 minutes by bike from downtown Puerto Armuelles. Almost the whole beachfront and many back lots are owned by expats. 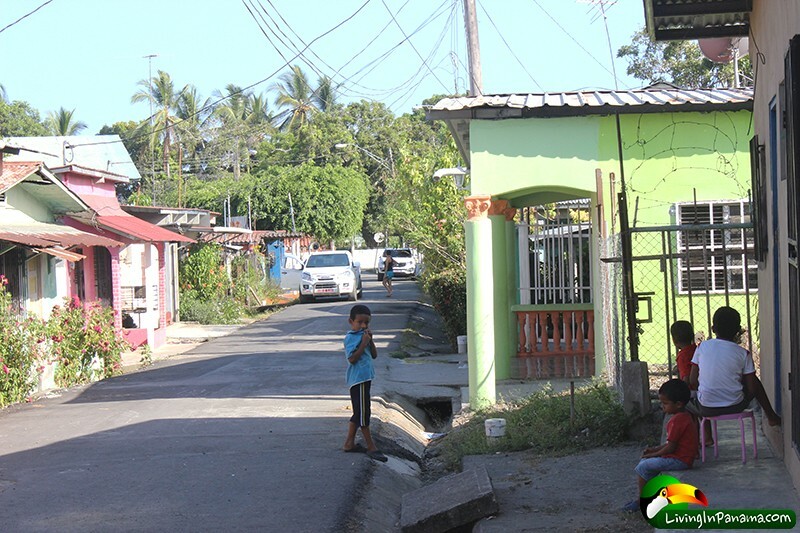 It is a small somewhat dense Panamanian neighborhood (lots are typically 100’ x 100’). Corazon de Jesus has about 225 lots on a street grid 4 blocks deep and 3 blocks wide. The beachfront area of the neighborhood is divided in two by a ravine with a seasonal river. In season, you can have fun surfing here. There are a couple of grocery kiosks as well as a baseball & soccer field. 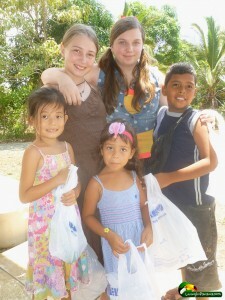 Corazon de Jesus is an active Panamanian community with occasional neighborhood events. 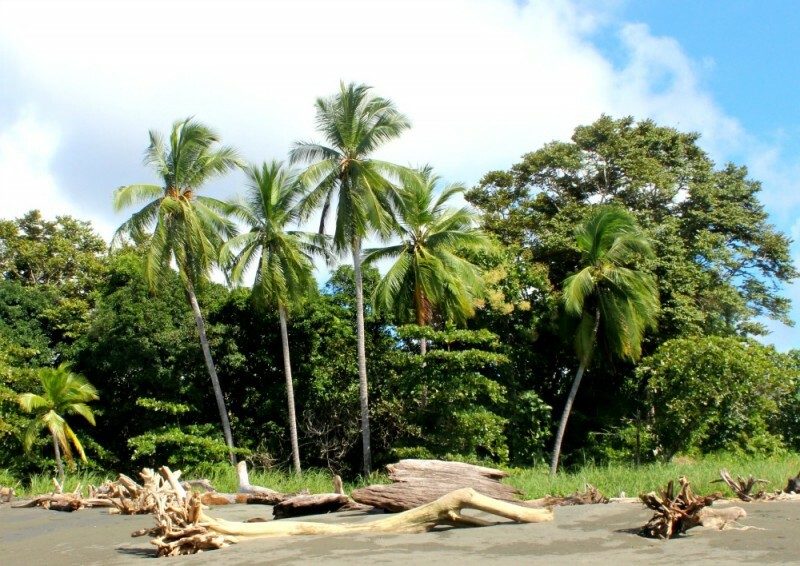 More and more of the back lots are being bought by expat retirees and investors alike. 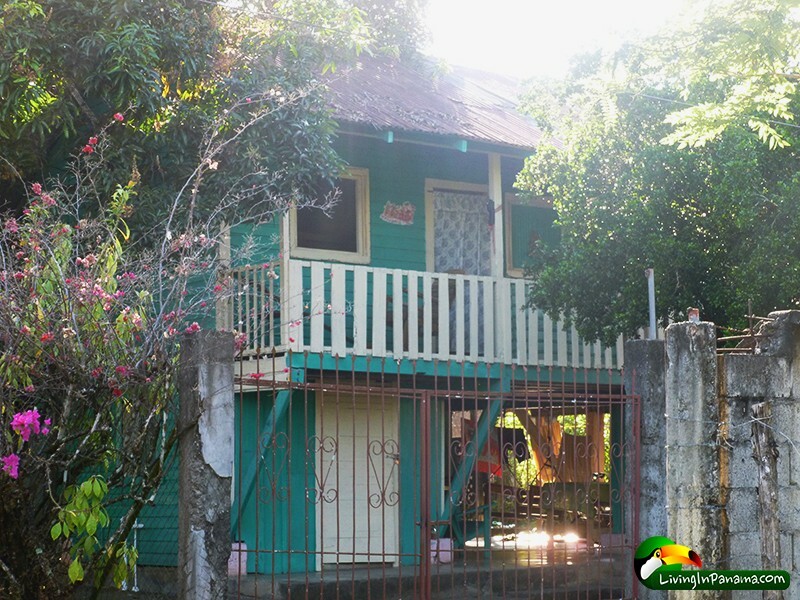 We have 2 properties for sale in Corazon de Jesus. A neighbor of house for sale. Across the street & 3 doors down. Coronado – This relatively new and poor neighborhood of small lots (65’ x 65’), can also be a bargain for property seekers. Coronado has a beautiful beach and a lot of bird activity. Coronado is becoming popular with investors. The neighborhood includes a few grocery kiosks. So far, there are 3 expat households in Coronado. One of those expats built an expansive & pleasant compound on the beach. We have property for sale in this neighborhood. Ask us about them. Our Coronado properties are not displayed online nor in this info book. 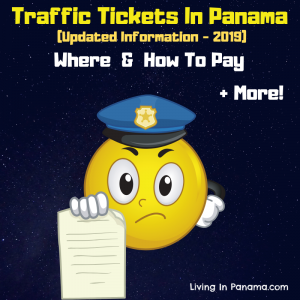 Cucuy – is about 20-25 minutes (depending upon weather and road conditions) from downtown Puerto Armuelles and down the road from Coronado. This neighborhood seems to attract Canadians, most of whom have built large houses on or near this beautiful beach. In fact, some of Puerto’s most upscale ex-pat owned homes are located here. 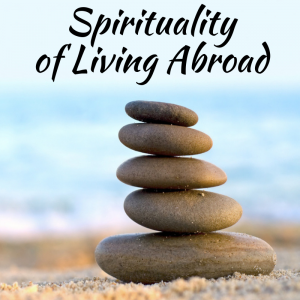 There are about 5 or 6 expats who live here either full or part-time (mostly part-time). 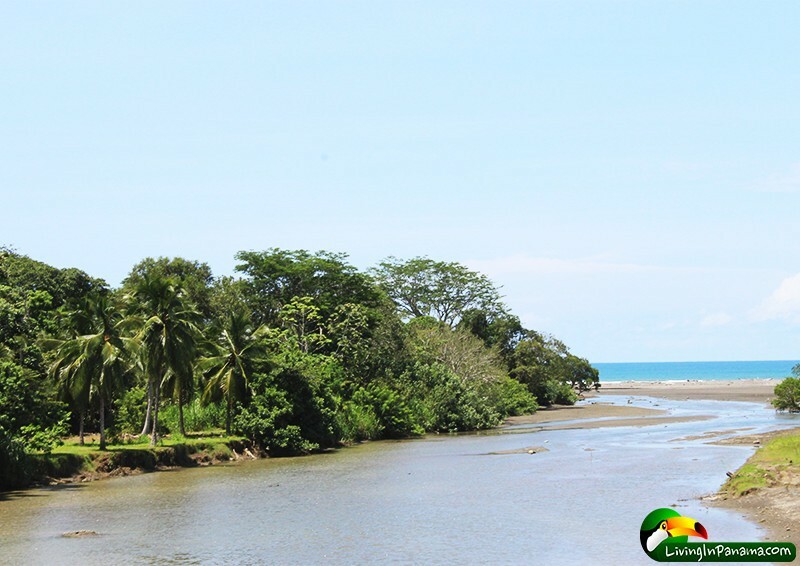 The Palo Blanco river is near by, which you can access via kayak for an ocean and river paddle. (I did a post about a kayak outing I did on that river, here.) 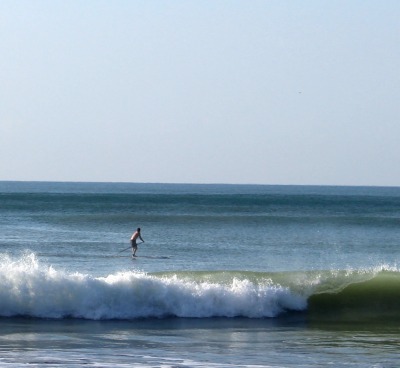 Being the neighborhood furthest from Punta Burica, the beach picks up more of the swell coming from the southwest, the prevailing wave direction. There are no services near by. Puerto Armuelles is a town with a unique character and feel. The fact that it is strung along the beautiful Pacific Ocean simply adds to its charms. 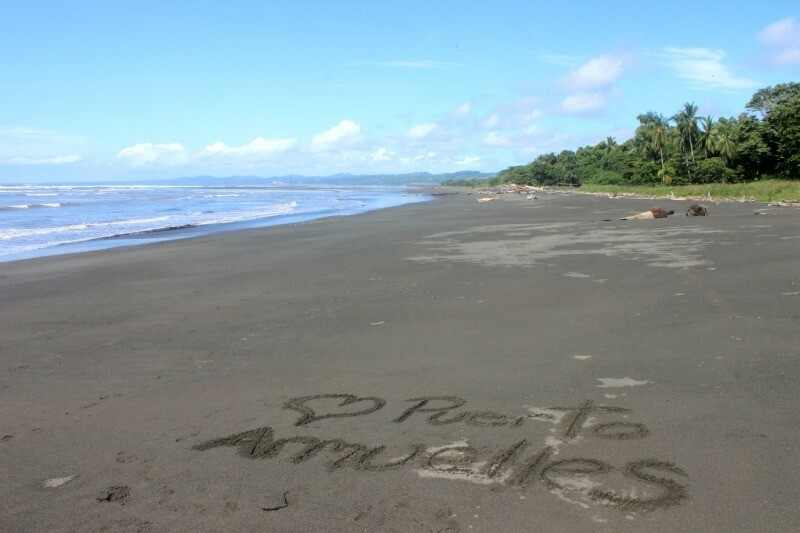 To learn more about Puerto Armuelles, start here.